Fr. Michael has been a priest for over 26 years. This is his 4th year as pastor of St. Paul. Prior to coming to St. Paul, Fr. Michael served as president of Bishop Ward High School in KCK. He has worked in the Hispanic Ministry and as pastor of other parishes in KCK for many years. He has degrees from Emporia State University, Trinity University (San Antonio), Gregorian University (Rome), and the University of Kansas. His favorite saints are St. Charles Borromeo, St. Rose Philippine Duchesne, and St. Paul. 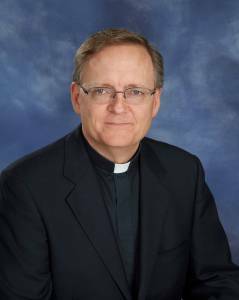 He is honored to be the pastor of St. Paul Parish in Olathe.